To commemorate the 50th Anniversary of the DLSU Archives, the Libraries will open the door of the Archives to the academic community on 28 July 2018, 9:00 AM to 5:00 PM. Library users may come in and view the collection and engage in the history that is uniquely La Sallian. 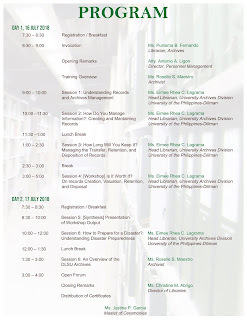 For inquiries, you may send an email to library@dlsu.edu.ph or contact Ms. Roselle S. Maestro, Archivist, at local 621. Live at the Libraries is an initiative to promote appreciation of culture and the arts through live performances, such as musical performances, dance performances, and poetry slams. Now on its seventh run, the Libraries will be holding a piano concerto that will coincide with the Archives @ 50 after-party celebration. Pianists who will be performing using the grand piano, now situated at The Learning Commons Lobby, will take center stage during this event. Updates on the Archives@50 Celebration​ and other upcoming activities will be announced through the Libraries' Facebook page. For inquiries, you may Chat with LORA, send an email to library@dlsu.edu.ph, or call local 620. 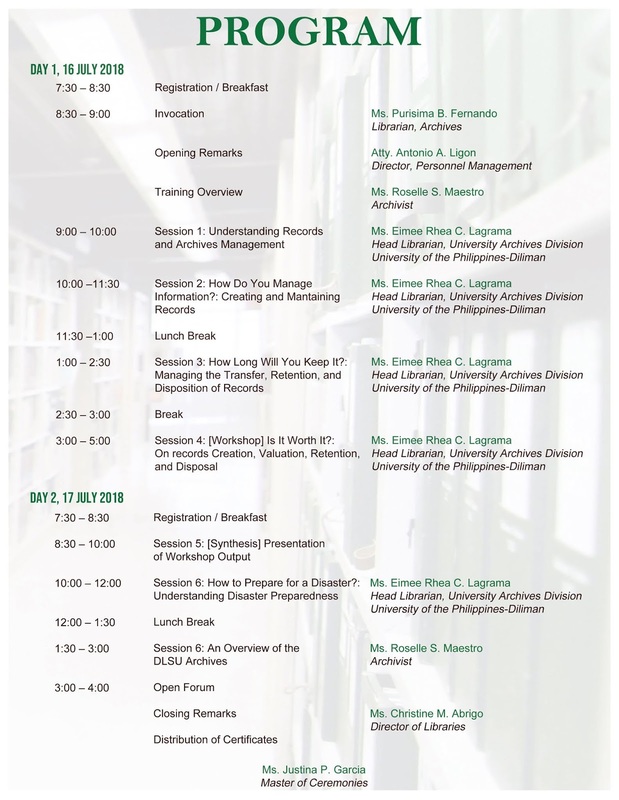 The Libraries, in partnership with the Office of Personnel Management, invites all the records managers from different departments and offices of DLSU Manila, Makati Extension Campus (MEC), Rufino Campus (BGC) and Laguna Campus to participate in a free, two-day training workshop entitled, What to Do With What You Create? 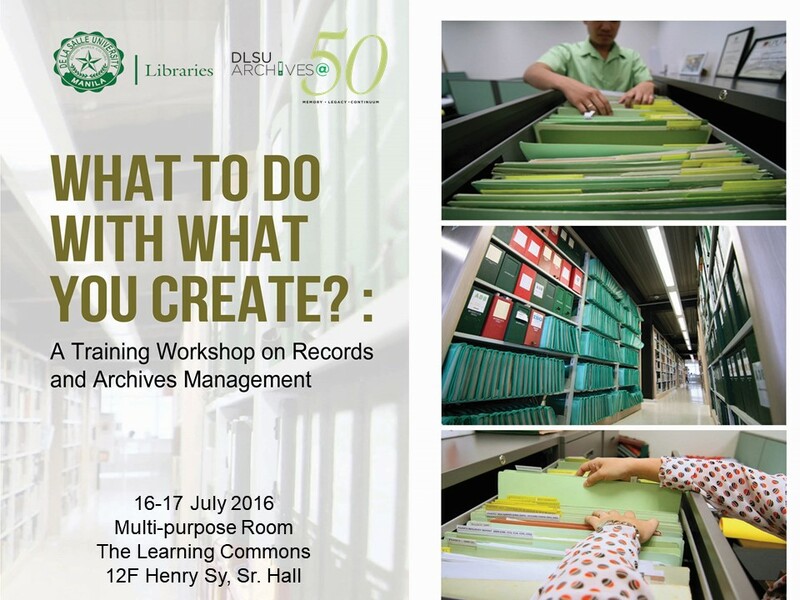 : a Training Workshop on Records and Archives Management, to be held at the Multipurpose Room, The Learning Commons, 12th floor, Henry Sy Sr. Hall on 16-17 July 2018, 8:00 AM to 5:00 PM. This training was conceived with the end in view of achieving efficient records management of all DLSU offices, and adopting a more strategic process of transferring university records to the Archives. Online registration is required due to limited number of slots (maximum of 60 participants). Interested participants are requested to kindly fill out this online registration form. Registration ends at 5:00 PM on Monday, 9 July 2018. As part of the DLSU Archives@50 Celebration, this activity aims to instill the value of paper conservation as one the sustainable solutions in maintaining archival and library collections and to teach basic paper conservation techniques. Karen Cecille V. Natividad is the Readers’ Services Coordinator of DLSU Libraries. She specializes in archival studies and administration and has conducted workshops on paper and book conservation. She earned her graduate degree in Library and Information Science specializing in Archival Science from the University of the Philippines Diliman. She once served as a member of the National Committee on Archives of the National Commission for Culture and the Arts (NCCA). Jan-Michael C. Cayme is an assistant professorial lecturer at the Chemistry Department of the De La Salle University, Manila, and a licensed chemist. He has several publications in local and international scientific journals on the chemistry of old building materials. He also holds a Masters’ degree in chemistry and currently completing his PhD in Chemistry at the University of the Philippines, Diliman. Among his other research interests include the use of chemistry techniques in analyzing the composition of heritage materials from historical churches and fortifications. Online registration is required due to limited number of slots (maximum of 3​0). Interested participants are requested to kindly fill out this online registration form. Registration ends at 5:00 PM on 06 July 2018. The De La Salle University Archives, established on 29 June 1968, is turning fifty years old this year. To commemorate this milestone, the Libraries will be holding a month-long celebration with an exhibit and a series of activities from 29 June to 28 July 2018. To commemorate the 50th Anniversary of the DLSU Archives, the Libraries invites the academic community to view the exhibit entitled, "De La Salle University Archives @ 50: Memory. Legacy. Continuum." at the Exhibit Area, The Learning Commons, 6th floor, Henry Sy Sr. Hall. The "Memory. Legacy. Continuum" exhibit is a three-fold narration of the fifty golden years of the DLSU Archives. Through historical records and objects from the collection, Memory features the story of the Archives, Legacy showcases its enduring role in preserving institutional memory, and Continuum presents a succession of photographs depicting the DLSU Archives' constant state of becoming. The exhibit is free and runs from 29 June - 28 July 2018, 8:00 AM to 5:00 PM. ​​The Libraries cordially invites the academic community to the 50th year anniversary celebration of the establishment of the Archives with the theme, “De La Salle University Archives @ 50: Memory. Legacy. Continuum.”, to be held on 29 June to 28 July 2018 at The Learning Commons, Henry Sy Sr. Hall. Updates on DLSU Archives@50​ and other upcoming activities will be announced through the Libraries' Facebook page.